There are many reasons why choosing a pre-paid debit cards work better for some. Maybe it’s a fear of piling on overdraft fees, or a simpler way to control spending, or maybe it’s due to credit issues. Whatever the case may be, Card.com offers an alternative form of banking for all of us. I was given the opportunity to try their Visa debit card a few days ago, and I found that not only is their website extremely easy to navigate, but setting up an account just took mere seconds to activate! The hard part was choosing a card from their thousands of design options. (Yes, really!) There are literally thousands of designs to choose from. I ended up choosing the designer couture one, because it reminded me a lot of one of my favorite brands – Kate Spade! I will say that there is a $5.95 monthly fee, but it’s waived if you setup direct deposit so keep that in mind. I also found it cool that you can load money to your account using Green Dot MoneyPak, Western Union, Paypal, or photo-capture a check using a smartphone app. 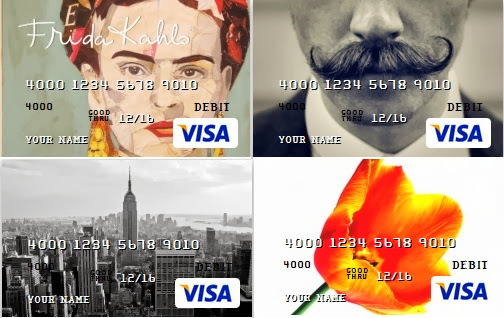 To get your own Visa debit card head over to Card.com to set up an account.